with a $1 billion investment. The total value of the top 10 landscaping projects in the UAE exceeds $5.8 billion, said the event organiser of the upcoming Urban Design & Landscaping Expo, the Middle East’s only dedicated trade fair for urban, green and open spaces. The world’s tallest building (the 828-m Burj Khalifa), the world’s largest indoor theme park (the IMG Worlds of Adventure, as big as 28 football fields), and the world’s biggest shopping mall (the Dubai Mall, with over 1,200 shops), are just some of the landmarks that have elevated Dubai to a leading tourist destination, with over 15 million visitors in 2017. The list of ‘biggest’, ‘largest’ and ‘tallest’ in Dubai will soon have another crown jewel, as the emirate plans to host the world’s largest theme park too by the end of 2020. According to the “Major UAE Landscaping Projects 2018” BNC Report published by the Urban Design & Landscaping Expo, Dubai is currently developing the “World Legends Theme Park” with a $1-billion investment. Nine zones with various rides will be complemented by 9,700 sq m of food and beverage options and 9,500 sq m of retail space, all set within a temperature-controlled environment. “The World Legends by IMG Group isn’t the only theme park currently under development in the United Arab Emirates,” said Josine Heijmans, portfolio event director of the Urban Design & Landscaping Expo. 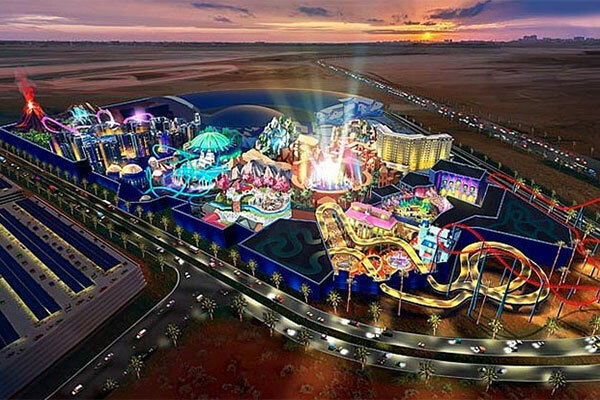 Abu Dhabi is expected to inaugurate the new $1-billion Warner Brothers World on Yas Island in 2021. With 29 themed rides, interactive attractions, shows, dining and shopping outlets, the project will also feature six immersive lands, including Metropolis and Gotham City, Cartoon Junction, Bedrock, Dynamite Gulch and Warner Bros Plaza, a Warner Bros-themed hotel and a car park. A third theme park making it to the list of top 10 landscaping projects in the UAE is Dubai’s Wonderland Park Development. With completion expected by 2019, the $490-million project includes the construction of amusement parks, apartments, shops, restaurants, and a cultural centre. Providers of products, services, and solutions for the outdoor design and build industry from around the globe are expected to come together in droves in Dubai next November during the Urban Design & Landscaping Expo. Co-located with The Big 5, Middle East’s largest construction event, the exhibition will provide a dedicated platform to meet the region’s booming urban design and landscaping needs. The Urban Design & Landscaping Expo will also feature a high-level Urban Design & Landscaping Summit.